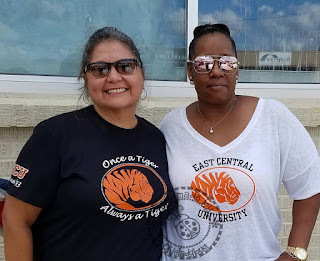 A few years ago when my son-in-law played football I made a lot of shirts for my family and his so we could show our support during the games and since then I haven't worked with HTV much but when my friend Andrea and her girls, which are my Goddaughter's, all decided to make it for homecoming this year I thought we needed to wear some matching shirts. 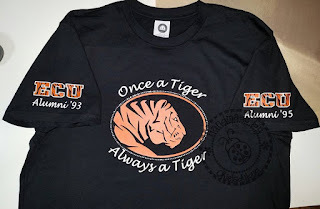 My oldest and youngest Goddaughters, Ashley and Amber, are both Alumni from ECU, as am I and my daughter is a student at the University so I got busy designing some shirts that we could show off at the parade and game. I was able to add our alumni years on the sleeves and my daughter has "Class of" on one of her sleeves. The shirt you see here is my shirt. I of course decided we needed a little bling on the shirts as well. Andrea brought me a white shirt to do the design on and she just wanted East Central Univeristy on hers. 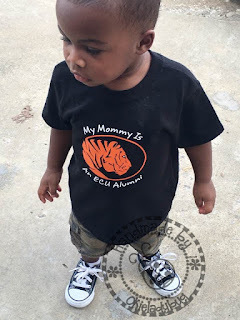 I at first had designed "Proud Mom of ECU Alumni" but I did as she requested and I think it turned out great! This is Andrea and I at the parade. Before we headed out to the game I had someone snap a picture of all of us in our shirts. I actually think this is the first picture I have of all of us together which is a bit sad since Andrea and I have been friends for 30 years and the girls have all known each other since birth! 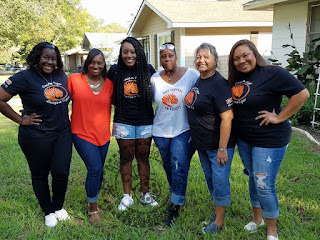 From left to right: Ashley, Eboni (she went to OSU instead of ECU), Amber, Andrea, me and my daughter Porsche or Shiane if that is what you would prefer to call her. Now that Ashley is a mommy and her son was coming as well I had to make him a little shirt as well. I don't think I have written anything about this little guy but let me tell you something...he has stolen my heart! Since he is my Godgrandson I might be biased about how cute and smart he is but I really just don't think I am. And the best part is that he seems to adore his Nana, which by the way is me! While our team did lose the game at last we were lookin fly sportin our glitzy t-shirts and the best part was all of us spending the day together! Are you selling the shirt? I would love to buy one for him!